11 years ago NATO, without the sanction of the UN Security Council, started massed bombings of the Federal Republic of Yugoslavia, which developed into the most wide-scale military operation in the Balkans since the end of the Second World War. The air bombings continued for two and a half months – from March 24th to June 8th of 1999. Taking part were more than 1,000 warplanes, which dropped 79,000 tons of explosives on Serbia. 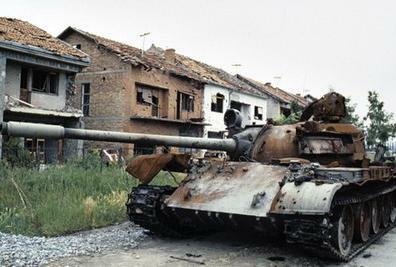 According to Serbian reports, 2,500 peaceful civilians were killed, and hundreds of dwelling houses, schools, hospitals, state institutions, and also cultural monuments were destroyed over that period. “All arguments were formal. Because, firstly, the talks were broken off by the Western allies themselves, which proposed an option, which, as they knew from the very beginning, could not be approved. Secondly, the massive flows of refugees from the Kosovo Province, which, which really occurred as a result of the armed clashes between the Serbian forces and the Albanian separatists and lasted for at least one year, did not slow down after NATO’s bombings. Therefore, the argument itself proved false. What really happened was this: NATO aimed to use the situation in Kosovo for the destabilization of the Milosevic regime, which the Western capitals regarded as unfavourable. This was done in fact”. The existence of a single Yugoslav state ran counter to NATO’s interests, since it served as an obstacle to the broadening of NATO’s sphere of influence in the South-Eastern direction. The USA and its partners thought that the establishment of the control over the Balkans would enable them to move their strategic facilities Eastward and parallel with this, to control the transport routes of the Caspian energy resources. The implementation of this plan began immediately after the disappearance of the Soviet Union from the political arena. And the initial stage was actually the collapse of former Yugoslavia in the early 90s, which occurred not without the support of the West. The aggression of the North Atlantic Alliance against the Federal Republic of Yugoslavia, tearing away Kosovo and the declaration of Kosovo’s independence by the Albanian separatists in February of 2008 can be regarded as the completion of this process. The U.S. military base Camp Bond-steel, which is the biggest in Europe, is situated in Kosovo today. This shows the new configuration, which the U.S. military presence in Europe is taking, following the end of the “Cold War”.